Weather warnings are in place for ice, and snow is expected later today in the north. Motorists have been warned after a number of rush-hour crashes on icy roads. Overnight showers caused severe icy patches, with more snow expected to cover surfaces later in the day. 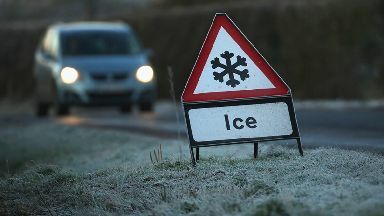 A weather warning for ice is in place until midday in the north of the country. "Road conditions in the north-east are a bit snowy this morning," Police Scotland said on Twitter. "The roads are wet and slippy and our officers have already responded to a number of collisions. "Please slow down and drive to the conditions. 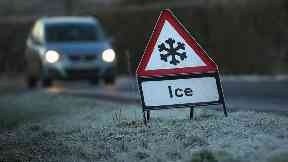 Warning for ice in place until 12pm today." Ferry passengers are being alerted to disruption to west coast services due to predicted "adverse weather" with cloud and showers expected. All sailings between Oban and Colonsay were cancelled on Monday with delays expected on other crossings. Walkers have also been told to "prepare for the conditions" after mountain rescue teams braved "appalling" weather in a bid to rescue an injured climber in the Cairngorms last night. In the central belt it should remain dry for the rest of the day, however heavy winds, sleet and showers are due to set in overnight and continue through tomorrow. A spokesperson for the Met Office said: "We have put weather warnings in place in the north east. "Overnight showers have caused icy patches and more snow is expected later today. "Drivers should be careful, especially on untreated roads."